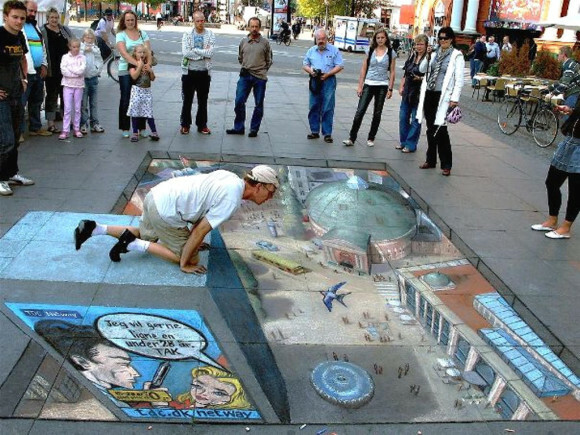 This is an image of street art that is a 3D optical illusion. It looks as if a man is crouching on top of a very tall building looking down on people, smaller buildings, and a bird. As real as it seems, it is actually just a painting on a sidewalk. Some reasons we perceive this image as 3D are occlusion, where one object partially covers others, and relative size, where the size of an item is compared to other items considered. An example of relative size in this painting is the people compared to the bird. We know that people are usually larger than birds, so the fact that the people are smaller than the bird indicates that the people are much further away than the bird.